SK Telecom T1 are well known for their ability to seamlessly sub players in and out during a game series after figuring out an opponent’s strategy. What the team isn’t known for, however, is role-swapping. So when Lee “Wolf” Jae-wan queued up in the jungle for SKT’s match against the ROX Tigers today, he turned some heads. Not only did he catch ROX off guard by playing a new role, but he actually played it very well, too. So well, he earned MVP of the series on SKT’s opening day. There were two reasons this move was so unexpected. For starters Wolf isn’t a jungler, aside from it being his secondary role in solo queue. Secondly, and perhaps more interestingly, SKT already has two junglers. Park “Blossom” Beom-chan was signed over a week ago to play as the team’s substitute jungler opening week behind veteran Kang “Blank” Sun-gu. 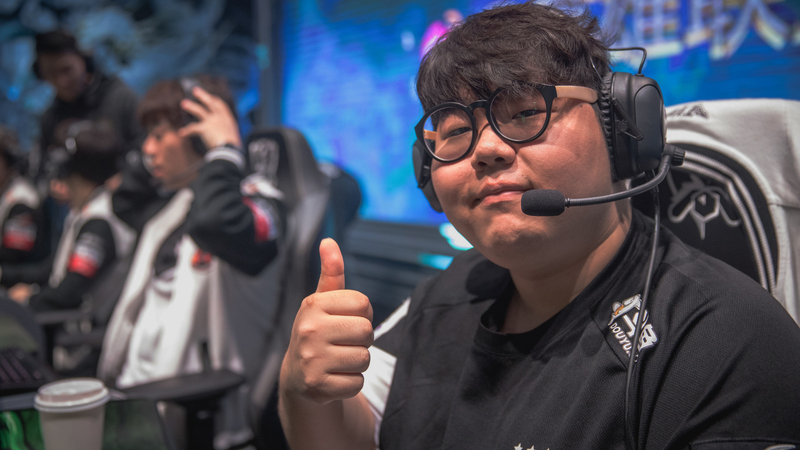 In order for Wolf to play as the team’s jungler today, SKT had decided that it was a better option than having either Blank or Blossom in the role against ROX specifically. According to Wolf in his post-series interview, this won’t be the last time this strategy is used either. That’s terrifying for any team facing SKT, because they’ll never know who to prepare for in the jungle, but it’s also worrying for SKT’s fans. They have two junglers on the roster, so why would Wolf need to be in this new role at all? Is something not working out with new jungler Blossom, or was this simply Wolf goofing around and trying something new? These are the questions that fans will be asking, at least until they know what to expect out of the revamped SKT roster. At the end of the day it won’t be too worrying, because it worked out way too well. Wolf’s playmaking abilities as one of the best supports in the world easily transferred over to the tanky playmaker Sejuani, and he was able to set up SKT in nearly every teamfight. He controlled the pace of the game, and SKT pulled off the win. SKT’s next game is against Jin Air GreenWings this Saturday at 6am ET. And who knows what formation SKT will line up in.